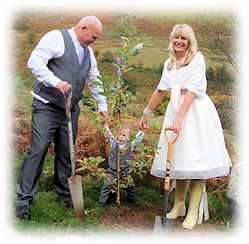 Our intention is to help you create a meaningful and memorable day at Pistyll Rhaeadr. We invite you to come and visit us to discuss your ceremony plans. The waterfall, with a 240ft drop, is the highest in Wales, surrounded by breathtaking scenery with sheer cliffs and woods to either side. At the foot of the waterfall is Tan y Pistyll, meaning 'little house under the waterfall', which now houses a café and self-contained apartment. We have a licence to enable civil weddings and partnerships to be conducted at Pistyll Rhaeadr. Ceremonies usually take place at the Prayer Lodge set in the lower garden, overlooking the river with the magnificent waterfall in the background. Your guests gather in the garden around you, to form an intimate setting for your ceremony. As a ceremony location it is truly a unique, special and magical setting, allowing and supporting a deep connection between you as you exchange vows, celebrate a rite of passage or mark a special moment. 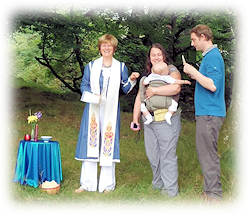 It is possible to arrange a Celtic Blessing or Hand-fasting ceremony, a blessing ceremony following a civil partnership and baby-naming ceremonies. This place has been used in the past as a place to come for special occasions of many kinds. They can be held in the privacy of the Prayer Lodge and its garden, and it can also include following the old custom of planting a tree in remembrance of the occasion and as a gift to this place. Be creative! 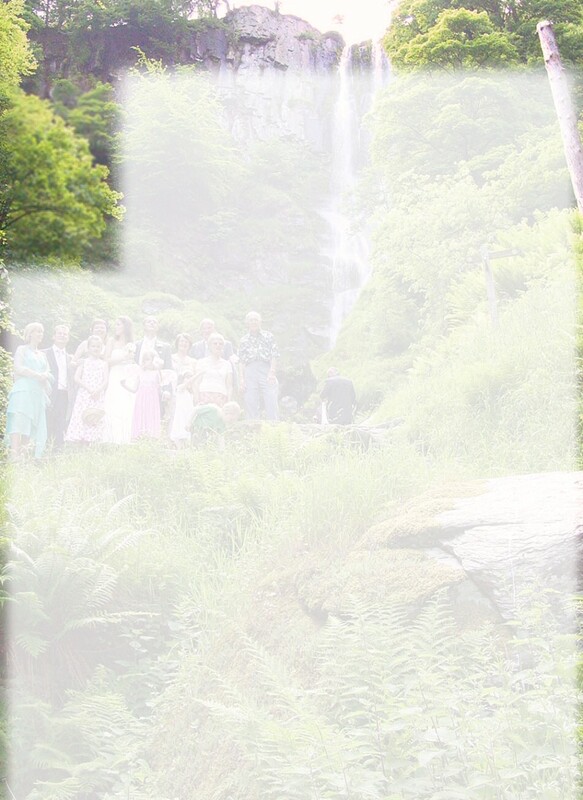 It is a true gift to have your ceremony here, for your love for each other to be witnessed and blessed by the Spirit of Nature - the Waterfall's presence. There is an opportunity for you and your guests to embrace this throughout the celebration, to be touched by the presence of the waterfall and the mountains. After the ceremony we can arrange a buffet reception in the lower garden marquee. We can cater for up to 60 guests with a choice of menus. During winter months the tearoom can be reserved for your reception. For an evening reception/function we can recommend local hotels. You can decorate the Prayer Lodge beforehand with flowers. Ceremonies can be held here between 11am and 3pm. The Prayer Lodge area and garden, if having a reception, are for your sole use on the day of your ceremony until 5pm. During holiday periods (Easter, May Bank Holiday week and school summer holidays) we are able to have ceremonies from Mondays to Fridays. At other times we have ceremonies from Mondays through to Saturdays. please contact Phill at the address below.